For additional information about this book, visit the website livingmoreworkbetter.com. How would your life change if it included a little more "life"? Gayle Hilgendorff had it all—and the workaholic stress and anxiety to prove it. After twenty-one years in Human Resources for a Fortune 500 company, she realized that her “work/life” balance leaned more toward work than life. So she did something about it—not by giving it all up, but by finding a way to have more. • Do you worry constantly about how others perceive your performance? • Does the idea of taking time off stress you out more than relax you? • Have you lost yourself in your work/family obligations and forgotten YOU? If any of those sound familiar, Gayle is here to help you start on your work/life detox. This is not the story of someone who woke up one morning and turned her back on all she had earned. Gayle simply made small changes on a daily basis to create a true balance, while still keeping the power and prestige she had worked so hard to gain. And now she wants to help you do the same. The pragmatic tips and suggestions—combined with the wit of someone who has gone through exactly what you’re going through right now—make this an unexpectedly enjoyable read. Better yet? It’s short and to the point. This is not a nine-week series, a trip to a meditation retreat or a simple feel-good moment. This is a book you can read in a few hours, act on tomorrow and enjoy immediate results. If you’re ready to see what your life could be like “living in balance,” what are you waiting for? Get out your pen and some Post-it notes and get to work! 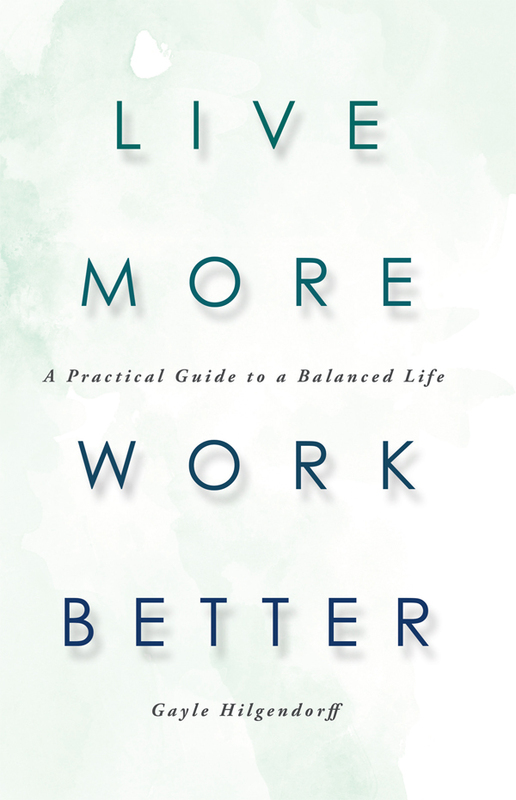 Live More, Work Better is a self-help book that coaches the overworked professional how to finally achieve balance in their life. The book has been described as a pragmatic and actionable road to balance, with a surprisingly enjoyable detour through self-discovery and life prioritization. Too many 'Work/Life Balance' books focus on why balance is important - making assumptions that readers are looking to reduce their working time and increase their personal time. Life in Balance takes a different approach. The book first helps the reader understand why they might feel 'out of balance' to begin with, and it's not always because we have too much to do. Out of balance is out of alignment with one's priorities and desires, whether that's at work, at home, or across the two spectrums. After the reader completes exercises to define their perfect reality, the remainder of the book then gives practical action steps to create true balance. Author Gayle Hilgendorff is also a dynamic speaker and Executive Health and Leadership Coach who has built her platform of healthy life balance and well being on the back of a twenty-one-year Human Resources career with a Fortune 500 company. Now a reformed workaholic corporate executive with an Integrative Health Coaching certification, Gayle is a sought after corporate coach and contributing blogger for The Huffington Post, helping others to find a healthy approach to life balance through realistic, practical actions for success.